What is all this alphabet craze you might ask? BB Creams are "beauty balms". They equal coverage plus have anti aging skin care ingredients. CC Creams are "color correcting". They have color correcting and light diffusing particles. DD Creams are the newest "dynamic do-all" creams. They combine major anti-aging benefits with coverage and hydration. What kind of coverage will I get with an Alphabet Cream? Excellent question that we know you are thinking now. You will find that this has more color than a tinted moisturizer but not as much as a makeup foundation. It is very blendable and actually may look "dark" when you first pump out a little bit. Don't worry, it will blend perfectly and give you just a hint of color. *Maybe enough where you don't need to apply a foundation! Which tint should I choose? Light tint will blend in nicely with all fair skin types. Medium tint will blend well with mid range coloring as well as darker. *This may be too light for the blackest types - though it does blend in very well and adjust. Can men use a this cream? Absolutely! This is a perfect cream to help blend in blemishes and other discolorations that we all get. Since "most" men don't feel comfortable applying foundation and/or powders, this can be an excellent tool to help them feel their best. This collection is perfect for those looking to simplify their daily regimen, and it is also excellent for those who aren't sure where to begin as they learn about cosmeceuticals and what they can do for them. This product is packed with amazing cosmeceutical ingredients engineered to help your skin to perform and look its best! Here are some facts about the main ingredients for your reference. Stem Cell Complex with: Euterpe Oleracea (Acai) Fruit Stem Cell Extract, Quercus Alba (White Oak Bark) Stem Cell Extract, and Perilla Frutescens (Chinese Basil) Stem Cell Extract. Calming and soothing properties rich in omega 3 and rosmarinic acid can help to plump tired skin while defending it from oxidative stress and neutralizing free radicals. Chondrus Crispus (Seaweed) Extract - Minerals & amino acids that provide proper environment for the development of firmer, healthier looking skin. Increase moisture. Smooth skin feel. Snap 8® - Octapeptide that has been shown to smooth facial lines by disrupting the SNARE complex formation. Studies in Vitro and in Vivo. Alternative to injections. 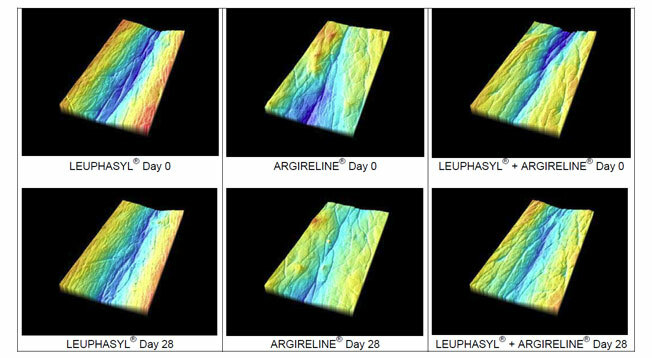 Argireline® - Minimizes the appearance of wrinkles and it is an alternative to well-known cosmetic procedures. In Vitro and in Vivo testing. Lauphasyl®- Peptide that inhibits the release of acetylcholine in the synapse, reducing muscle contraction. Synergistic effect + argireline or snap 8. SynAke® - Blocks Na+ uptake at the post-synaptic membrane to inhibit contractions. Matrixyl® - *- also known as Palmitoyl Pentapeptide-4, consists of five amino acids that are structured for optimal skin absorption. Once absorbed, Matrixyl stimulate collagen production and strengthens the dermal matrix of the skin's support structure. One clinical study showed that Matrixyl was just as effective as retinol in repairing sun-damaged skin, without the redness and irritation caused by retinol. 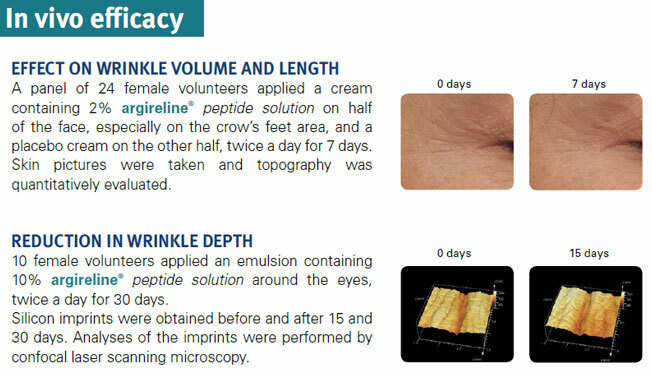 In another study Matrixyl visibly decreased the amount of wrinkles in as little as two weeks. Matrixyl 3000® - Matrixyl™ 3000 contains two matrikines, Pal-GHK and Pal-GQPR. Acting as messengers of cutaneousrestructuration and repair, these two peptides work synergistically to restore and maintain the skin's youthful appearance. Best if used within two years of purchase date.